Pollination is the process where plants receive pollen from other plants of the same species so they can reproduce and form seeds. Many plants are pollinated by animals, and most of the animal pollinators are insects. The relationship between plants and their insect pollinators is beneficial to both the plant and the pollinator. The insect pollinator receives food, usually in the form of nectar, while it spreads pollen from plant to plant aiding the plants reproduction. Pollination is really just a “happy accident” that happens when an insect visits a flower to get food. The insects do not know they are pollinating plants as they are finding food for themselves. Insects have been pollinating plants for approximately 140 million years, since the dawn of angiosperms (flowering plants). Flowering plants lure pollinators to them with scent, visual cues, and food. Learn more about the process of pollination at The Plant Pollination Process. More than one-third of our food supply depends on pollinators. Without pollinators there would be no apples, onions, oranges, pumpkins, and many other fruit and vegetables. There would be no coffee, chocolate, nuts, or cotton for our clothes. Without pollinators our world would be a much different place than it is right now. Gather flowers from your yard or visit a local flower shop and get flowers to dissect. Cut the flowers in half. Identify the different parts and talk about what they are and how pollination works. Visit a local apple orchard, garden, or even walk around your schoolyard this spring to observe pollinators (bee, butterfly, moth, beetle, etc). Identify and record each species you find. Note native vs. non-native pollinators. Plan and plant a school garden for pollinators. Already have a school garden? Add plants for pollinators or devote a section to pollinators. Even growing a few pollinator-friendly plants in containers can be beneficial! Blank Park Zoo: Plant. Grow. Fly. Become part of a new conservation initiative to help protect native pollinators! Whether you have several acres, a small back yard, a schoolyard, or even a business courtyard – you can make a difference! Plant seeds, watch them grow, and help our native pollinators thrive! More than just a clearinghouse for information on insects, this site helps expand on the natural histories of our subjects. See an insect in your garden that you can’t identify? Ask for help here. The Pollinator Partnership is a non-profit organization– the largest organization in the world dedicated exclusively to the protection and promotion of pollinators and their ecosystems. Birds, bats, bees, butterflies, beetles, and other small mammals that pollinate plants are responsible for bringing us one out of every three bites of food. They also sustain our ecosystems and produce our natural resources by helping plants reproduce. Over the past twenty years native ladybugs that were once very common have become extremely rare. We’re asking you to join us in finding out where all the ladybugs have gone so we can try to prevent more native species from becoming so rare. BeeSpotter is a partnership between citizen-scientists and the professional science community designed to educate the public about pollinators by engaging them in a data collection effort of importance to the nation. To better understand and conserve North America’s dragonfly migration, dragonfly experts, nongovernmental programs, academic institutions, and federal agencies from the United States, Mexico, and Canada have formed the collaborative Migratory Dragonfly Partnership (MDP). This site will allow you to submit dragonfly migration observations. Looking for a great way to help you identify insects you see in Iowa? Check out this site! Need gardening advice? This group is a valuable resource. Native plant profiles, garden design articles, pictures, environmental news, and much more. We help DIY homeowners, schools, and small businesses choose native prairie plants adapted to your landscape for ease of maintenance and maximum wildlife draw. Whether it’s walking your garden with you, performing light maintenance, or working up a landscape plan, we promise a thriving native plant landscape that gives you four seasons of life and beauty. The Brenton Arboretum is a 501(c)(3) non-profit organization dedicated to serving the community by bringing joy to all through the beauty and knowledge of the natural world of trees. The arboretum accomplishes this mission by focusing on quiet enjoyment, education, research and conservation. Visit and enjoy over 2500 labeled trees and shrubs, grass walking trails, the O’Brien Nature Play Area, green roof Pavilion for picnics, and many beautiful vistas. This living museum of trees is situated on 143 acres and open free to the public every day from 9 am until sunset. Butterflies and Moths of North America is an ambitious effort to collect, store, and share species information and occurrence data. For help with butterfly species in your garden this is a great resource. The Monarch Joint Venture (MJV) is a partnership of federal and state agencies, non-governmental organizations, and academic programs that are working together to support and coordinate efforts to protect the monarch migration across the lower 48 United States. 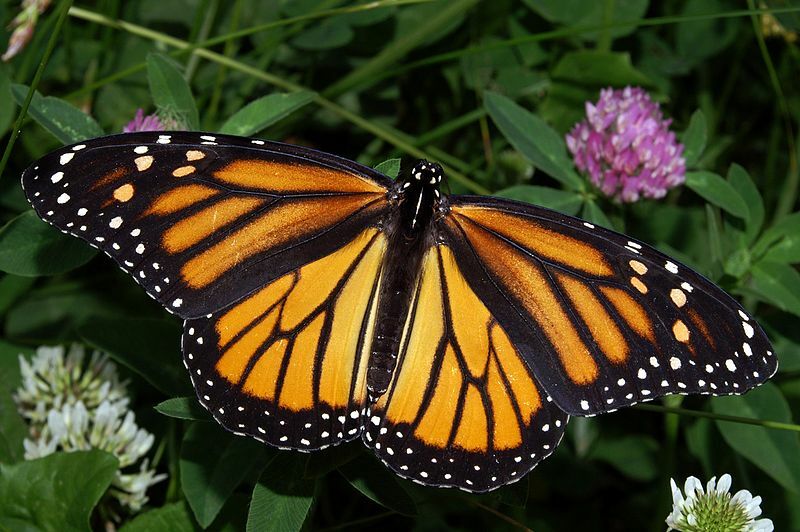 Monarch Watch is an organization all about monarch butterfly conservation and milkweed habitat preservation. They provide resources about monarch biology, butterfly gardening, and educational resources. eButterfly is a free, user-friendly way for butterfly watchers across North America to record, archive and share their observations anytime, anywhere. It is also an important tool for conservation, providing researchers with a comprehensive picture of the abundance and distribution of butterflies. The North American Butterfly Association (NABA) is the largest group of people in North America (Canada, United States, and Mexico) interested in butterflies. We are a membership-based not-for-profit organization working to increase public enjoyment and conservation of butterflies. Monarchs and More curriculum aims to promote and facilitate inquiry-based education through original curricula and research opportunities. We use monarchs and other insects as focal organisms in inquiry-based teacher workshops and conduct an annual Insect Fair to spotlight student research. The monarch butterfly serves as an excellent tool to get students excited about science and to teach inquiry in the classroom. The Iowa Native Plant Society is a forum for plant enthusiasts, gardeners, and professional botanists to exchange ideas and information. Together they work to encourage conservation and ethical use of Iowa’s plants, promote education about Iowa’s plants, their habitats and cultural habits, preserve of these plants and their environment, and appreciate and enjoy Iowa’s native flora.